Jats and Rajputs from the Indian state of Rajasthan wear distinctive turbans. Rajputs traditionally wear colored turbans whereas Jats wear white turbans. The Marwaris wear light colored turbans. Many styles of turbans are found in Rajasthan; it is said that the style of the turban changes with every 15 km you travel. 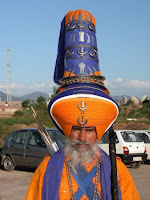 In some areas, especially in Rajasthan the turban’s size may indicate the position of the person in society. ‘Royalty’ in different parts of India have distinctly different styles of turbans, as do the ‘peasants’, who often just wear a small piece of cloth wound around the head.